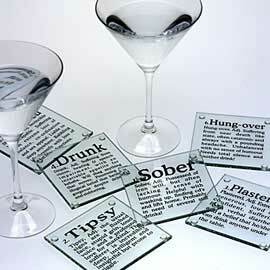 The concept of novelty coasters with a clever saying or a little message on them is familiar to the point of banality. However these take the concept to the next level raising the level of elegance by printing the message on high quality crystal clear glass. Not terribly functional, a sweaty glass will slip and slide across the surface of these coasters. But they are mildly clever, and they might start a conversation, so as a decorative piece they aren’t terrible. This entry was posted on Friday, October 3rd, 2008 at 1:57 pm	and is filed under Home Decor Reviews. You can follow any responses to this entry through the RSS 2.0 feed. You can leave a response, or trackback from your own site.